To make the fresh tomato sauce, drizzle olive oil in a pan and set over medium heat. Add onions and garlic and cook until soft but with no colour. Add 600g cherry tomato halves and cook until broken down and juices released. Add passata sauce, rinsing out bottles with 1 cup water and add to the pan. Add chicken stock pots, thyme and bay leaf and allow to simmer gently until thickened and reduced, about 40 minutes. (Alternatively, place in a 140C oven to cook). Remove from heat and pass through a sieve. Bring a large saucepan of salted water to a boil. Add pasta and cook until slightly underdone. Drain pasta and drizzle with olive oil. Place a large fry pan over medium heat and drizzle with olive oil. Add remaining cherry tomato halves and chilli flakes, to taste. 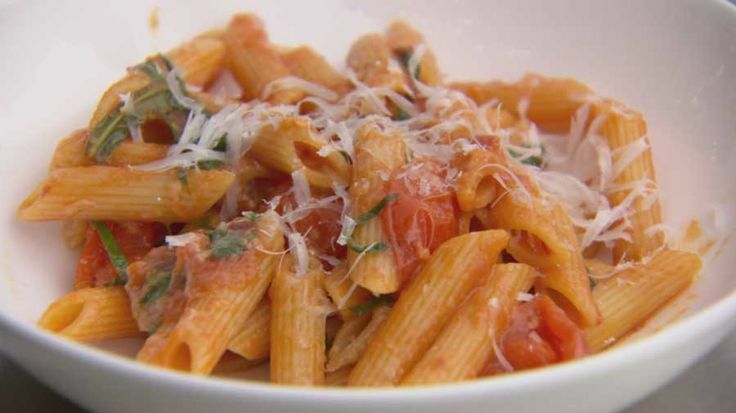 Fry briefly then add 2-3 cups tomato sauce, chopped basil and drained pasta and toss to coat. Season with salt and pepper and serve with grated parmesan cheese. (Package remaining tomato sauce into containers and store in the freezer for later use).